Looking at a wind farm, including land purchases, wind turbines, and transmission gear, one might come to the conclusion that wind power isn’t all that cost-effective, but not once you figure in the ongoing costs. What ongoing costs? Exactly none, is the point that Stephen Byrd made in the November Columbia Energy Symposium. Mr. Byrd is head of Morgan Stanley’s North American Equity Research for Power & Utilities and Clean Energy, and he estimates that the average natural gas power plant costs $30/MWh (megawatt-hour) in the Mid-West United States. 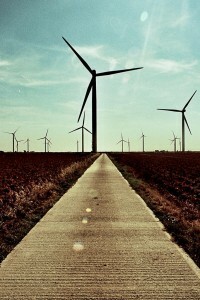 Wind power projects in the same areas, however, are being built for as little as $25/MWh. “The trick with both wind and solar is… the very high fixed costs to build these technologies. The ongoing variable cost is close to nil… in the Midwest, a wind farm can produce power at a capacity factor of 50-plus percent, that’s a lot of units of power to spread your capital costs over, and that’s why the cost of these agreements can be in the $25 range,” Mr. Byrd went on to explain. True, there are some maintenance costs with regard to transmissions, generators, and switching gear, in order to keep a wind turbine running at its peak efficiency, but ongoing wind power expenses pale in comparison to the ongoing costs of coal, natural gas, and nuclear power plants. Fossil fuel power plants need to continually buy fuel and dispose of waste. Nuclear power plants have a very special problem when it comes to disposing of waste, which makes for a very expensive proposition. Last year, wind power grew to 60GW capacity, which accounts for 5.5% of all the energy production in the United States. In the Mid-West, this cost-effective solution is even competing with local coal plants, and very well, at that. Interestingly, in spite of the ten-year $22/MHh federal tax credit, Mr. Byrd notes that some wind power projects still have a lower all-in cost than natural gas power plants, which are booming because of the falling price of natural gas from fracking projects.